Residents of Australia are no strangers to the difficulties created by the weather in regards to personal property. Australia is a nation of extremes in its climate, with storms sweeping the nation year in, year out, with buffeting winds and of course, hail. Storm season is officially upon us, which means increased storm activity and so increased risk of damage to all property. Planning and preparation is key; clearing up outside your home, closing windows and parking undercover whenever you can should be a standard precaution. And make sure that you have adequate insurance cover for all your assets. The violent storms that ravage Australia’s states cause damage to thousands of vehicles each year. In some cases, this damage can be catastrophic, making vehicles uneconomical to repair. In truth, any and all damage to a vehicle is something any car owner would much rather avoid, and damage from hail is one of the most common causes. But, thankfully, there are measures that can be taken to avoid it, if you follow these steps. First and foremost, have a plan of action. If you know what to do ahead of time, you can save precious moments and a whole lot of stress by being able to confidently and competently deal with the problem. Most important of all, do not panic. Do what you can to protect your property, but do not risk personal injury in doing so. 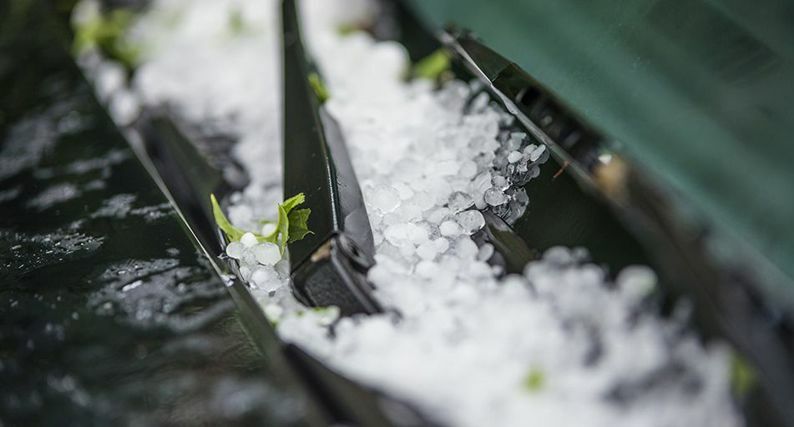 In the case of hail, there are a range of options you can take to avoid damage. The first and most sensible, is to get your vehicle under cover! A garage or even an awning will do. There are also car covers one can buy, that will completely encase a vehicle. But be aware, you may need some time to put it on. Practice doing so, before it becomes necessary to do it in a hurry. In a pinch, if you can get a feel for the weather itself, make use of buildings as cover as well, putting your vehicle in the leeward side and out of the worst of the falling stones. If you are in transit at the time, find a way to leave the road and make use of the nearest available cover, and wait out the storm there. If you can’t find cover and if it’s safe to get out of your vehicle, the most sensible thing to do is to put a buffer between the hailstones and your vehicle. A thick blanket could do, or even the floor mats of your vehicle – in particular, you should protect the windshield. Hail stones can shatter and crack the glass and reduce visibility, leaving a driver potentially stranded. Have the means close at hand to protect your vehicle from the storm, but remember, never use your own body to protect against the storm. Hailstones can cause terrible damage to a vehicle, but they can do even more against a person. Never endanger yourself. The weather is, as anyone in Australia can tell you, a rather fickle affair at the best of times! But there are ways you can work around this. The best we at Budget Direct can offer our customers is the Hail Hero Hail Warning System – a free service to all Budget Direct Car Insurance customers. Should there be a risk of hail hitting your residence, Hail Hero will send you a text message to give you the time you need to move your car and protect it from damage. Otherwise, you can keep track of weather services and of course, be aware of the weather itself. However even with weather forecasts and warnings from organisations such as The Bureau of Meteorology (BOM), storms, rain and hail can strike very hard and very fast and often catch people by surprise. We here at Budget Direct strongly recommend any measure that lets you be aware well ahead of time! Remember to always try to keep informed and respond accordingly. If there is even a chance of a storm causing damage in your area, take steps to avoid the worst of it. Don’t park under trees, and don’t leave your car exposed out in the open! Storms can be intense and terrifying to be caught out in. A hail storm is not just that, but also very dangerous. Even if the stones are not large, they will severely cut down visibility and also cover roads in ice, making driving much more difficult. If you receive an advance warning, or are caught by surprise, the answer is the same – slow down and get off the road and stop as soon as it is safe to do so. If possible get the car under cover to protect window glass and panels from damage and hold out until things are clear again. And remember, it is almost always best to stay in the vehicle until the storm cell passes; don’t get caught out in the open yourself. Unless there is an emergency that keeps you on the road in the first place, there is nothing that will not wait until you are clear of the storm. Take the time once you’ve stopped out of the weather to call ahead of where you are going and let them know you’ve been delayed. Most people will understand! If all else fails, remember your car insurance policy! If you are unsure if your vehicle is covered, check and make sure. But remember that avoidance is always the best solution!